With his Michelin-starred restaurant and plaudits aplenty, Bruce Poole is one of the country’s leading chefs whose inspiration lies in the greats of the French food writing genre. Make the butter the day before you intend to serve this dish. Take the butter out of the fridge in advance to soften and put it into a mixing bowl. Melt the extra knob of butter in a small stainless steel pan over a low heat and sweat the shallots until softened – 5 minutes or so. Add the wine, bring to the boil and reduce by 95 per cent. It will resemble a glaze when reduced down enough. Remove from the heat and cool. When the wine and shallot syrup has cooled completely, add it to the softened butter, using a rubber spatula to get all the glaze out of the pan. Beat the glaze into the butter with a wooden spoon and season with salt, a pinch of cayenne pepper and a squeeze of lemon juice. Roll the butter into a cylinder using cling film and refrigerate overnight. Set the oven to 175°C and, when hot, roast the hazelnuts for 10 minutes or until lightly browned and aromatic. Remove from the oven and allow to cool. Chop roughly with a heavy knife. Cut the root end of the endive in order to separate the leaves. You need six to eight leaves per person. Set a large non-stick frying pan over a high heat and, when hot, pour in a thin film of vegetable or olive oil. Add the endive leaves to the pan without overcrowding them – this may be done in batches. Season the endive with salt and a sprinkling of sugar. Fry hard for 3-4 minutes until the endive begins to colour and wilt. Add half of the butter (again in batches, if necessary) and season the butter as it foams over the endive. Transfer the cooked endive to a tray and keep warm. Heat the grill to its highest setting. Finely chop the chives. Warm four plates. Clean the pan in which the endive leaves were cooked. Return the pan to the stove and get it hot. Season the scallops with salt and pepper and pour a thin film of vegetable or olive oil into the pan, followed swiftly by the scallops. Sauté the scallops briskly for 2 minutes without moving them. Flip them over with tongs or a fork and cook the other side for another couple of minutes. Add the remaining butter, season and baste the scallops with the butter. Squeeze in a few drops of lemon juice and transfer the scallops to the tray with the warmed endive. 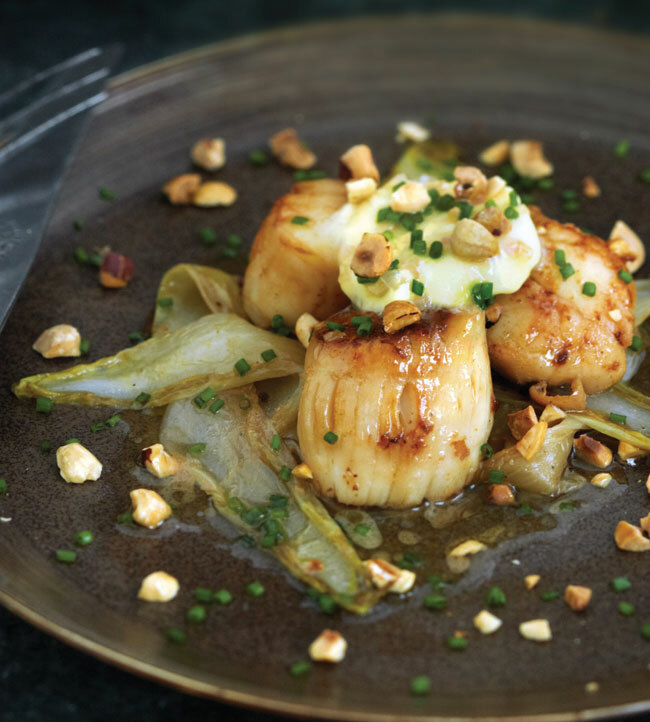 Arrange the endive leaves on the plates with the scallops on top. Slice the Sauternes butter into four 5mm pieces and pop on top of the scallops. Very quickly flash each plate under the grill simply to glaze the butter, not to melt it – a matter of 2-3 seconds or so per plate. Scatter on the roasted hazelnuts and chopped chives and serve. Very posh.